Household hazardous waste (HHW), according to the EPA is defined as, “Leftover household products that contain corrosive, toxic, ignitable, or reactive ingredients… Products, such as paints, cleaners, oils, batteries, and pesticides that contain potentially hazardous ingredients require special care when you dispose of them”. Household hazardous waste can cause hazardous situations and is very dangerous to human health and the environment. Proper disposal and management of HHW can eliminate ground water contamination and other hazardous situations. Household hazardous waste materials can be toxic, flammable corrosive or reactive. When properly disposed in a household hazardous waste facility, individuals are less likely to become exposed to these hazardous materials and hazardous events are less likely to occur. Furthermore, reducing the amount of HHW stored in one’s household can prevent accidents and leaks from corroding containers. Proper disposal techniques can also prevent groundwater contamination that may endanger human health and the environment. Benefiting human health and the environment, by properly containing HHW, can benefit future generations. The Wake County Environmental Services Department, Solid Waste Management Division identified the need for an on-site storage building at the Northern and Southern Wake County household hazardous waste facility. Due to the large volumes of HHW in the Northern and Southern side of Wake County, Wake County Environmental Services Department decided to have scheduled collections once a month. Disposal vehicles were on-site until filled and replaced as needed resulting in multiple vehicles trips. The Wake County Solid Waste Management Division made an effort to justify the need for a permanent storage building that would reduce the frequency of trips to the contractor’s collection facility in Greensboro, NC. No grants or funding outside the county budget were requested or required. The expenditures saved by reduced travel costs helped justify the cost of a permanent collection building. As HHW volumes increased, Wake County expanded collection to six days per week, Monday through Saturday, at both North and South HHW sites in Wake County. By increasing the number of service days, Wake County has been able to reduce the contractor staff required for less frequent collections. Wake County not only has seen a remarkable increase in cost savings, they have created a strong and healthy environment for generations to come. From the founding of U.S. Chemical Storage in 1983, U.S. Chemical Storage has consistently been the leading manufacturer in household hazardous waste buildings in the United States. 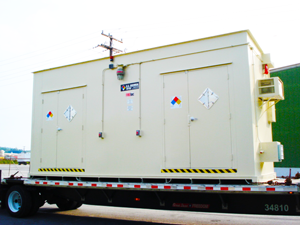 Our household hazardous waste storage buildings offer full compliance, complete protection and 100% customizability. We offer the safest and most reliable household hazardous waste buildings on the market. Our household hazardous waste buildings are designed to safely contain flammable, corrosive, toxic and reactive household hazardous materials. Keep costs down, while benefiting your personnel, environment and investments with a household hazardous waste storage building from U.S. Chemical Storage.